The Singapore Flyer, a giant observation wheel that features brilliant engineering breakthroughs a world apart from the traditional ferris wheel, is set to be Asia's most iconic visitor attraction. Standing at the Marina Bay at a height of 165 metres (height of 42-storey building) with a wheel diameter of 150 metres, with the Singapore skyline as the backdrop, It will provide breathtaking, panoramic views of Singapore and beyond. 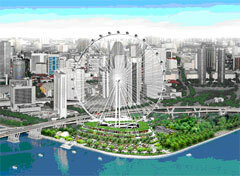 Inspiration for the Singapore Flyer sparked from national icon like the Eiffel Tower and the London Eye. On this inspiration, Dr. Kisho Kurokawa of Japan and DP Architects, Singapore developed the initial concept behind the Singapore Flyer's design. Asiatic is proud and to be part of this iconic structure. Our pumping equipment was chosen to provide water pressure boosting and circulation of the chilled & condenser in central air-conditioning of the main entertainment building, which is designed and constructed by Takenaka Corporation of Japan. Pumps supplied include, 8 units of Monoflo End Suction Centrifugal pumps and a set of 4-pump, Variable Speed Drive (VSD) pressure system.